A university that lost its licence to recruit overseas students in August has also seen a sharp fall in the number of new domestic students. 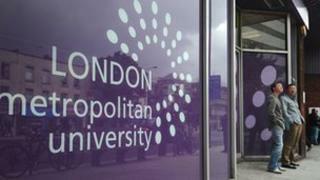 London Metropolitan University was the first in the UK to lose the right to recruit outside the European Union. So far in this academic year it has less than half the number of new students it had in the previous year, figures obtained by the BBC suggest. The university says the figures are only a snapshot and will improve. The university denies this and is challenging the action through the courts. In September, the courts gave the university a partial reprieve, allowing it to teach existing overseas students until the end of the academic year. Its vice chancellor, Prof Malcolm Gillies, said the effect of the Border Agency's action had been "substantial" but that other factors were involved. He said the university had cut the number of courses as part of efficiency measures and last year over-enrolled, going over its student number limit, so always planned to reduce its numbers, and that it is still recruiting. "There are students whose applications are still being processed and there are enrolments which are still hanging on what the Student Loan Company is doing," he said. "That's not within our control." Prof Gillies said the university was "84% towards their recruitment target for domestic and EU students" for this year and had been one of the few to be given funding to increase its intake this year. He said other universities had also seen a fall in numbers and that once official figures for all universities were published in December, that would be clear. He added: "We are going to the High Court. We are going to get our licence back and next year we are going to show there is still a big demand for London Met."